Twilio Functions are a perfect fit for mobile app developers. You can focus on writing your app, and let Twilio host and run the server code you need. You don't need a special SDK to call Twilio Functions from your mobile app - your function will respond to a normal HTTP call, making it easy to call from standard iOS Networking code. In this guide, we'll show you how to set up a simple Twilio Function, call it from a web browser, and then call that function from an iOS application. Our function will return a joke as a string. You could extend it to make it choose a random joke from a list, or by category. We'll keep it simple, and just return a hard coded string. At the end of the guide, we'll have a link to the rest of the Functions documentation, where you can learn more about debugging your function. As you can see, several things you might have had to spin up a whole server for before are now templates that you can easily use as a base for customization. We're going to write our own Function, so choose the Blank template, and then click the Create button. The Function Name is "Blank" - you use this as a descriptive name for your function in the Console, so feel free to change that to something more descriptive. 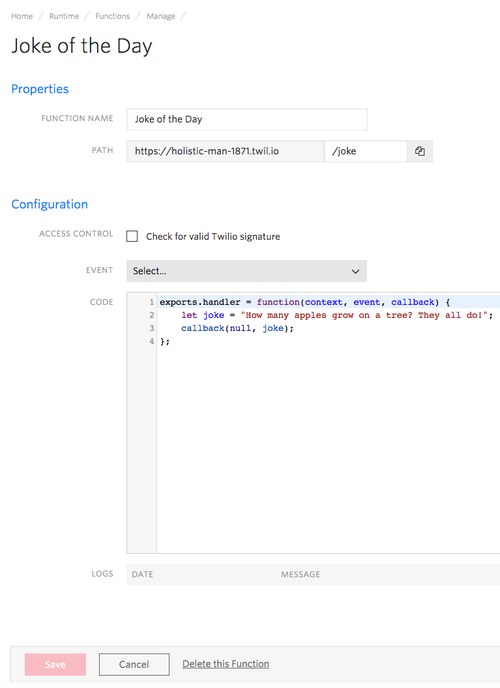 In our case, we're going to make a "Joke of the Day" function, so change the Function Name to "Joke of the Day". For the path, your account will have an auto-assigned domain name that you use for your account's Twilio Functions. Because you might have more than one function, you will want to have each function listen on a different path. For our purposes, we will put "/joke" in for the path. Under Access Control, we could have this Function check for a valid Twilio signature before responding. This is very useful for creating webhooks with Twilio Functions, but we will be calling this Twilio function directly from the mobile application, so the inbound HTTP request will not be signed by Twilio. Be sure to leave this checkbox unchecked. The Event dropdown is also useful for writing a webhook with Twilio Functions (you can choose between Incoming Message or Incoming Voice Call), but you won't need to select either one of these to use the a Twilio Function from a mobile app. Last, we'll need to edit the template code that was included - by default, it comes with some code to return TwiML. We're only going to return a joke. And it's a bad joke. Copy that code into the Twilio Functions code editor. Please, change the joke to something better - it won't be hard to do. Press the "Save" button to save that code, and Twilio will deploy your function for you. A little bit about what that code does - a Twilio Function gets three arguments - context, event, and callback. The context contains configuration you set on your Twilio Function - you can set environment variables through the console that get passed to the function every time it is executed, and you can also check a box to pass an auth token with your account SID as well. You can use that combination of account SID and auth token to initialize a Twilio REST Client, or use a pre-initialized one that is available on the context. The event contains any GET or POST parameters passed to the function at the time it was called. 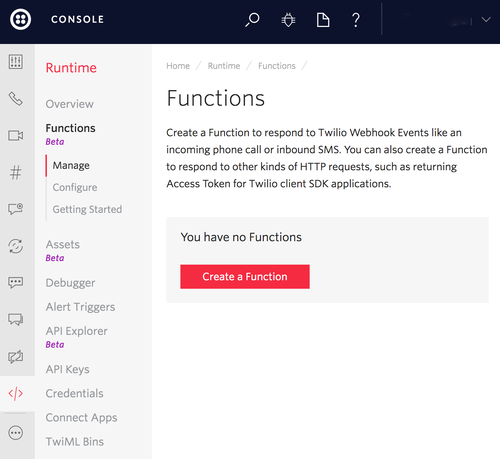 Calling your new Twilio function from the web couldn't be easier. Simply get the URL to your function by clicking the "Copy" button next to the path, and then paste the URL into any web browser (you don't have to be authenticated with Twilio). You'll get a text response of whatever you return from your function! We can use the standard iOS library to call our Twilio Function. The URLSession (NSURLSession with Objective-C) class lets us create a data task that takes a URL and a closure (completion block in Objective-C) as an argument. Your closure will get the HTTP response, the Data/NSData returned by the server, and an error (if there was one) as arguments. We check to see if the error exists, and if it does not, we create a string from the Data and print it out. Be sure to call resume on the task to initiate the HTTP Request - this step is easily forgotten. If you are calling Twilio Functions from an Xcode Playground with Swift, you will need to tell the Playground to run indefinitely (so the HTTP call can return). From iOS, we call this Twilio Function the same way that we did our first Twilio Function (don't forget to change the path to /jokes). Instead of creating a String/NSString from data, we will use iOS's built-in JSON Serialization to parse the response data into an array. 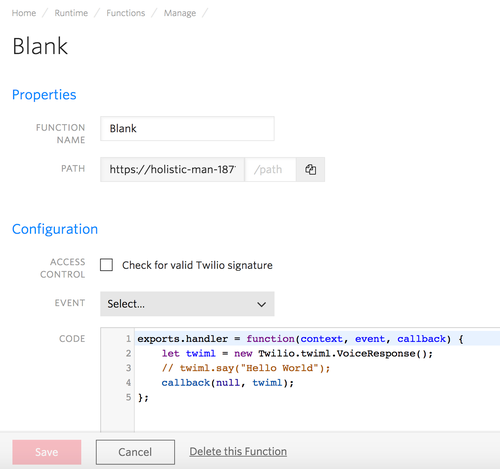 Now you can see how easy it is to run Node.js code as a Twilio Function, and how your mobile application can use a serverless backend to provide data for your application. Where to go next? You could extend the Twilio Function to choose a random joke from that array. You can also use Twilio functionality from inside of your function, for instance to send an SMS, or to return an access token for Video, Chat, or Sync. 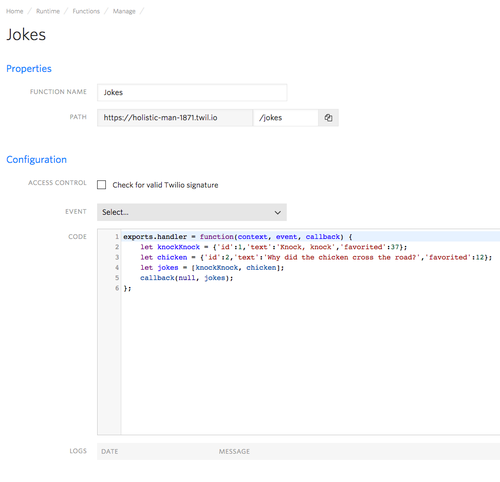 Check out the Programmable SMS Quickstart for Twilio Functions and Programmable Voice Quickstart for Twilio Functions for a quick intro to Functions. Our documentation for Functions is also avaiable, if you have questions about how to debug your function.